Whether you have a cottage, villa or apartment management of your holiday lettings is simple using Holiday-Bookings-Online. Customers can check availability, make a reservation and receive confirmation - at any hour of the day or night. This gives your business the opportunity to take secure bookings 24/7 from around the world. Holiday-Bookings-Online professional holiday accommodation rental software has helped some owners increase occupancy levels to over 90%. This cost effective booking software is suitable for property owners with a single cottage, villa or apartment through to agencies with multiple properties. Not only does the online booking system help generate more bookings for owners; it also makes the management of your bookings easier. Management of your tariffs, invoices, booking preferences, deposits and reports is simple via the online admin control panel. Our channel manager saves you time by updating the availability calendars of numerous of advertising sites automatically. The booking software allows you to take secure payments online via PayPal or a merchant account as well as via bank transfer or cheque. The online booking system includes not just an online booking calendar but also a sophisticated availability search facility which is useful for accommodation owners and agents with lots of rental properties. It also includes a special offers page, enquiry page and rental tariffs page - essential tools for a successful accommodation provider. With UK based phone and email support, Holiday-Bookings-Online software provides friendly and effective help when setting up and using the property reservation system. Getting started using the set up wizard is easy. 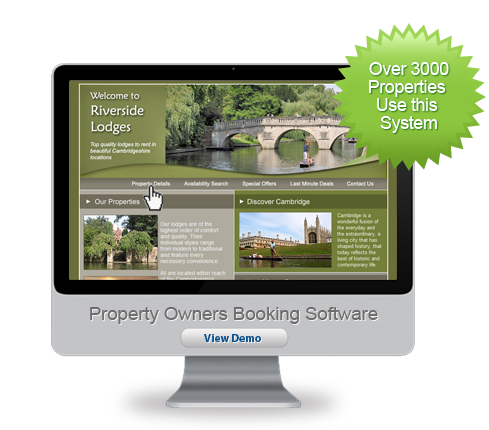 Try the accommodation booking system software today to see how your business can benefit from secure online bookings. Click here to see how the booking system works or take advantage of a FREE TRIAL. An online booking system that’s easy to set up and manage. Links to your availability and booking calendar with simple HTML. Holiday-Bookings-Online is one of the leading online booking system providers for self-catering accommodation owners. Very high customer satisfaction with the easy to use reservation system. Using this online booking system can significantly increase property's occupancy rates. The online reservation system includes a comprehensive admin control panel that makes booking management easier and less time consuming. Manage your online bookings from the office, home or even when away on holiday. Holiday–Bookings–Online booking calendar and search pages are as much as 10 times faster than competitor online booking systems. Daily back ups of booking system data ensures your data is safe and secure.